When we rolled out to Austin for our annual Louisiana gumbo pop up, one of our cooks gifted us with a plump, freshly-smoked Texas turkey breast. We flew that big thing back to New Orleans and made club sandwiches out of it for a few days before we had a eureka moment. 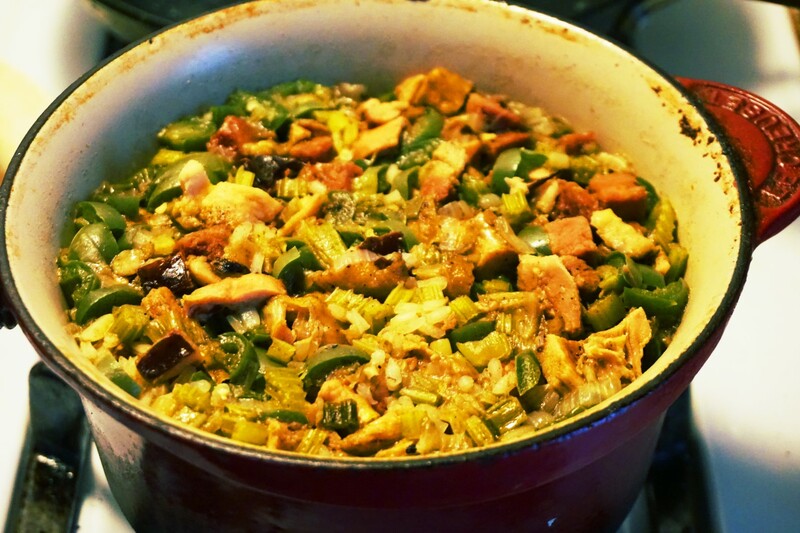 Time to make a fat pot of smoked turkey jambalaya. We rummaged around in the freezer and found a log of andouille sausage that we bought out in St John the Baptist Parish a few months ago then dropped to our knees to root through the fridge for celery, green onions, jalapenos, and master stock. Whooeee, this is gonna be good. Harry Choates on the hi fi completed the picture. If you heed this formula it will provide the best jambalaya you have ever eaten. We also make a version with crawfish and pork sausage.